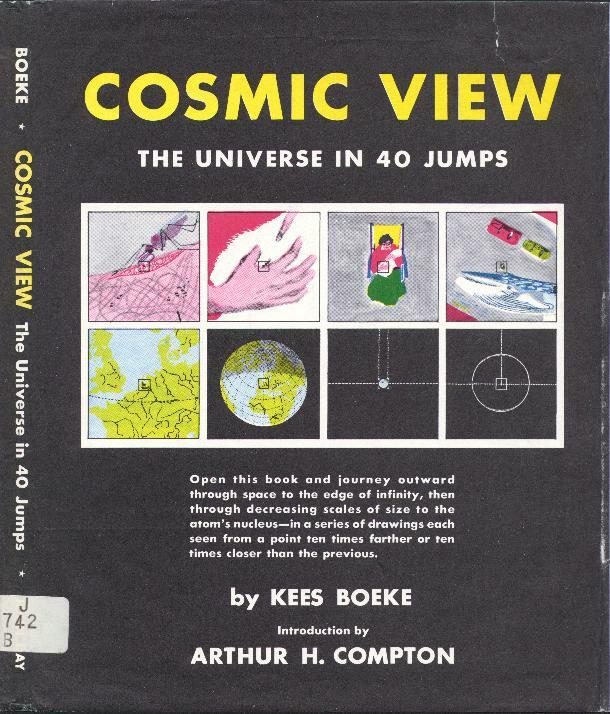 This is a copy of Kees Boeke's book, COSMIC VIEW: The Universe in 40 Jumps (1957). Kees Boeke's Cosmic View is a classic on learning about the scale of things. It is similar to the Morrison's Powers of Ten, but aimed at a younger audience. Its legacy includes Charles Eames's film Powers of Ten, the resulting book by Philip and Phylis Morrison, and several similar books which followed. Unfortunately, the problems Kees hoped to address, including peoples' understanding being fragmented by scale, remain as pressing today as they were in 1957. I place it online in the hope of encouraging awareness and activity in this area. Comments welcome - Mitchell Charity. If you enjoy this book, you might also like my A View from the Back of the Envelope. A note on copyright. I have placed this book online without permission. 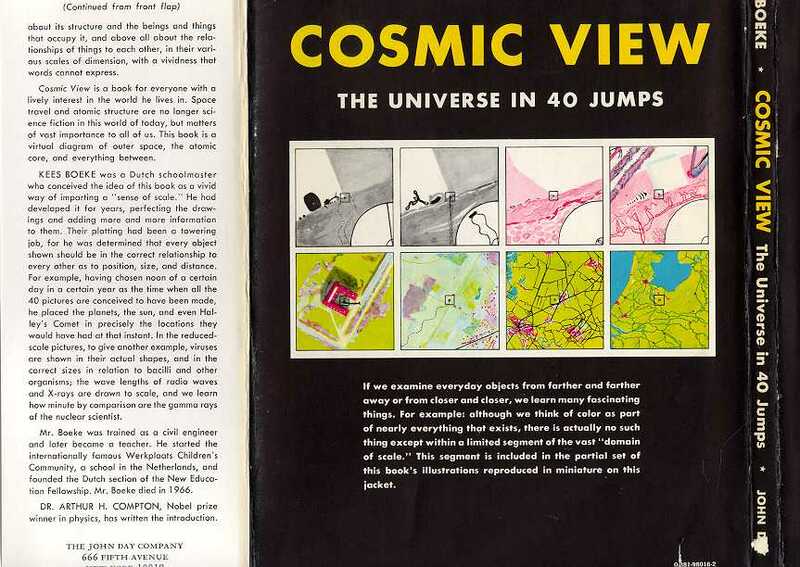 It has been 4 decades since Cosmic View was written, 3 since Kees Boeke died, and perhaps 2 since the last printing. Out of print, difficult to find, and largely forgotten. 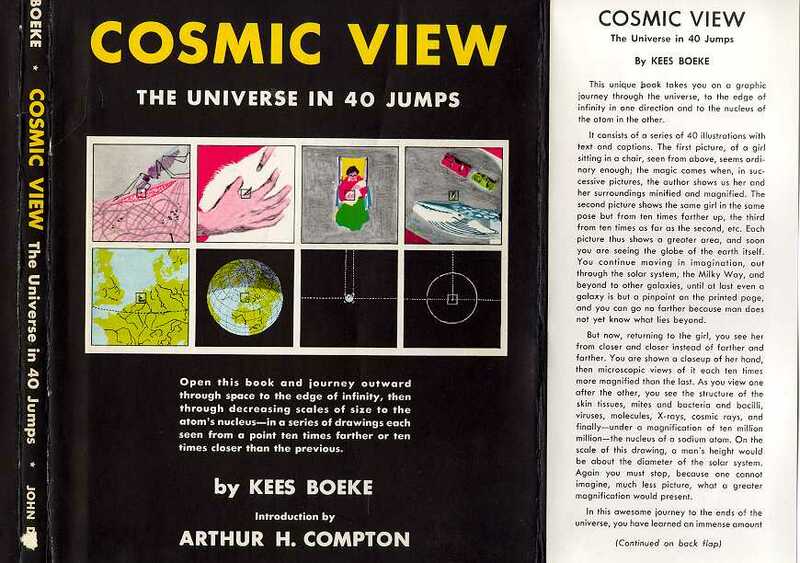 My hope is this noncommercial posting will further Kees's goal that every child and grownup develop a "cosmic view". If the current copyright holder, whomever that now is, should ever raise objection, the attached pages may go away. The images in the book were intentionally 15 cm across. Rather than trying to make this happen on your screen, I have included a ruler for calibration. My images are smaller than the originals, and of lower quality. Some of the science is dated. Some of the illustrations are color as thumbnails on the inside covers, but mono in the book. I have not included the thumbnail diagrams from the inside covers. I have not included the `nested squares' icon from the front cover. I have not included jacket front and back text (it's rather bogus). A few spelling errors have been been preserved. Clean up the intro text. Should have a different background than Envelope. Observe a user to reality check interface. Do thumbnails page like inner covers. Add `some of this science is dated' flag to pages? 2001-Jan-04   Added 'the url of this page is'. 2000-Mar-07   Added large images of the full jacket. Thanks to a reader for the suggestion and the images. jacket thumbnail. Thanks to a reader for the suggestion. 1998.Jul.07   Added link to `A View from the Back of the Envelope'. 1998.Jun.08   Corrected an OCR error ("whole" -> "whale", pg 7). 1998.Jun.05   Created over the last few days.